Dismissal is a pretty crazy time at my school. When you think about it, having over 700 kids going in different directions all at the same time, that makes sense. Therefore, each teacher is assigned a dismissal duty. Mine this year has been standing in a stairwell, making sure kids don't run down the stairs. It might seem trite, but try having dismissal without teachers standing guard in the stairwell and see what happens! Several months ago, one of the 6th graders, whom I don't teach, got into the habit of standing with me in the stairwell during dismissal. She leaves a bit later than the other students. Since she has been a pretty big behavior problem in her classes, her teachers have been all too happy to send her to hang with me until her departure. In that true magic of me simply not being her teacher/authority figure, we have gotten along really well. It got to the point to where if I was late to my dismissal duty, she would come find me and demand that I come talk to her. Today was the last day of school, as well as my last day of teaching period, since I am leaving the profession. I have many, many conflicting emotions going on today, but I wanted to just boil it down to this one moment. For our last dismissal duty date in the stairwell, this particular student requested Rita's Swedish Fish flavored water ice. Oh yes, water ice is a BIG deal in Philly. I told her that I would be sure to be there right on time, water ice in hand, at our spot in the stairwell. 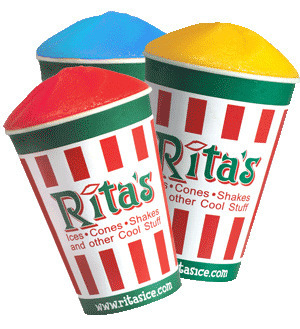 My last class went a bit overtime with goodbyes and all, and all of a sudden, I found myself with seven minutes to get to Rita's water ice, get the treats, and head back. As I was running to Rita's, it hit me that this is what it truly means to be a teacher. Teachers will do anything for their students - anything to win their trust, to be reliable, and to set good examples. Students never really do know what goes on in the "backstage" of a classroom. They never will truly understand the late nights of grading, the hours of lesson planning or how much teachers really agonize over who to put in a group to work together. Nor should they. Students should just assume that these adults will always be there who care about them. That's the true magic of being a teacher, and I truly admire those teachers who teacher for their entire careers. I arrived back to school, sweating profusely with one minute to spare. The student nonchalantly strutted down the stairwell, said, "Oh hi, Tr. Julie," and casually thanked me for the water ice. In her mind, there was absolutely no doubt that I would be there. That moment was exactly how my last day of teaching was meant to end.